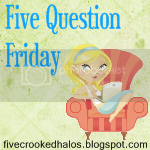 Friday: MBA Widowhood, Toddler Beds and Five Question Friday. Ahhh the weekend. I wish I could say I am looking forward to this weekend with great anticipation, but alas, besides a few things we have planned with friends or Brayden's swim lessons, the rest of it I could pass on. You know, like being at the house with a husband who has secluded himself to the room to study (welcome back MBA widowhood-- I have not missed you one bit and will be grateful when you leave my presence in a year! ), or the 60% chance of rain and thunderstorms we are expected to receive... which only means one thing in my book... a cranky toddler that I can't kick outside. Nevertheless, I'll try to be grateful for the few days I have, regardless of how stinky they may be. Remember how we switched Brayden to a toddler bed in fear that he'd jump out again. Well, ever since that time, he does splendidly going DOWN to sleep, but waking up is a different story. He loses his paci (which I know we need to wean from, but seriously, I can only handle one change at a time right now) and so he cries, or he thinks he's "all done" and it's only 6am. Which I know is a normal wake time for a lot of 2 year olds, but considering he was sleeping until atleast 7am when the crib was there, this is not good for us. We have the room babygated, which means that he stands at the door, yelling "I'm ALL DONE!" to us, or opening and shutting the door loudly. This causes Connor to wake up, so I end up having two kids up at 6:30am. Any suggestions on keeping him IN the bed until 7am (and strapping him to the mattress is not an option-- unfortunately). Leave the suggestions in the comment section. Or if you're embarrassed to do that you can just email me. 1. Have you ever forgotten your child in a store or at school? Considering both of my children go from car, to cart, to car again, it's hard to forget about them. Well, that, and the incesstant whining about wanting 'dat' or wanting 'out', I'm not sure there's much room for forgetting them right now. I'm sure it will come. My first date was with a guy named Josh. I was a freshman in college. We went to Chili's. We sat in the bar, and i couldn't help but be distracted by the college football stuff that was playing on ESPN (the tv was right behind him). That's probably one of the many reasons that he never asked me out again. I wouldn't go on a date until the next semester, and thankfully it was with the man I am married to now. Not much heartbreak in my life over boys, which I am more than grateful for! That I'll get caught picking my nose while I'm driving. Not that I ever do anything like that. seriously though, I have no idea. I am not a fearful person. Calculated, yes. But not generally fearful. 4. Confrontation: do you cause it, deal with is as it comes, or run far far away? I cause a lot of confrontation, sometimes not even on purpose. I generally deal with it as it comes... I don't like stuff hanging over my head too long. I have never run far from confrontation, but as I have gotten older I have tried to stay away from it as much as possible. Life's too short to get too bent out of shape about things. 5. Wood floors or carpet? Ahh, the great debate. I am mixed. I would love, love, love my living room to have hard wood floors. All of the traffic goes through our living room, so the carpet is nasty, and would be nasty 2 days after we installed new carpet. But I think I'd love to keep carpet in the bedrooms. Nothing like waking up early in the morning to pee and having to walk across cold floors. haha!